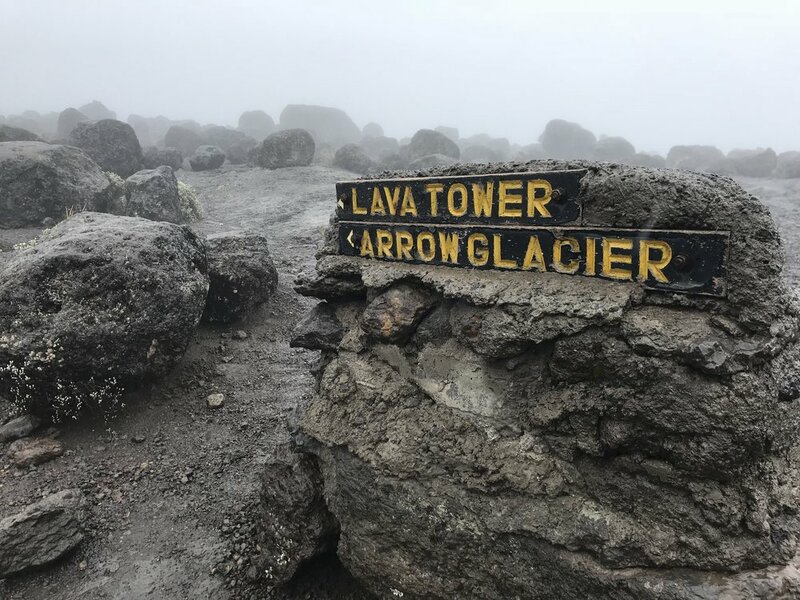 In October 2018, we set out to climb Mount Kilimanjaro to fundraise for the Leukemia & Lymphoma Society. Together with a group of 19 other LLS Climb2Cure participants, we began our 8-day trek. We’ve compiled our favorite photos with the highlights of each day! Thank you all for your support as we trained and prepped for the trip, but more importantly, thank you for your generous support of the cause that is so important to us. 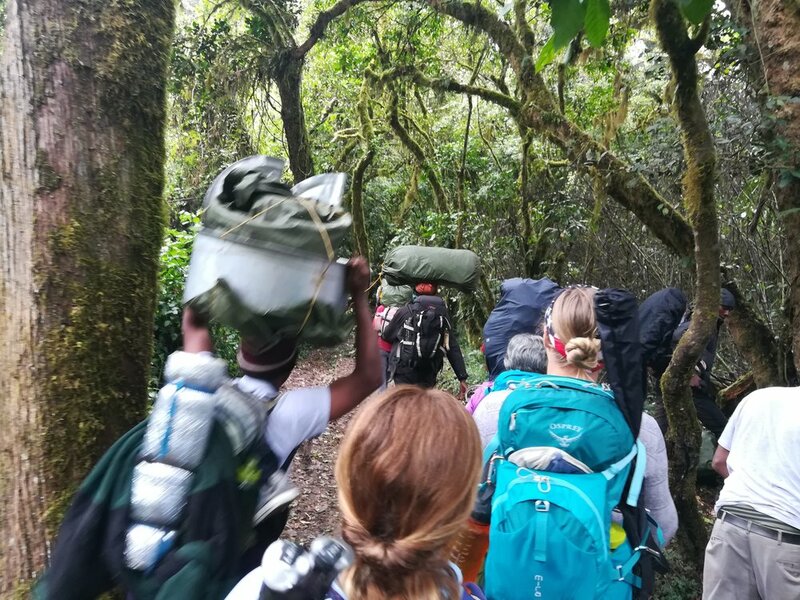 After two days in the town of Moshi, a thorough briefing and gear check, and introductions to our climbing groups, we set off on the two hour drive to the starting gate for Kilimanjaro’s Lemosho Route. 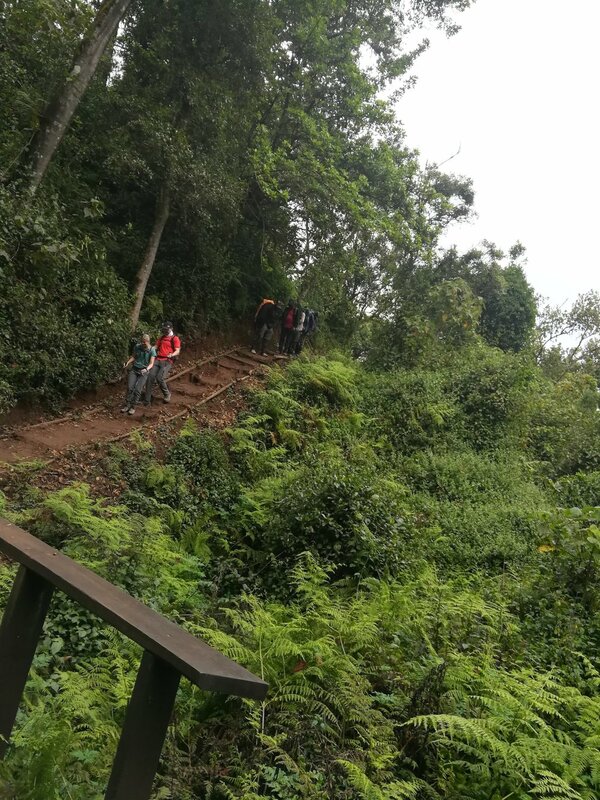 We quickly learned the meaning of “pole-pole” (“slow slow”) as porters passed us on the trail, up hills, through the rainforest. The porters (39 of them, plus 5 guides) greeted us with singing and dancing when we arrived at our first camp. 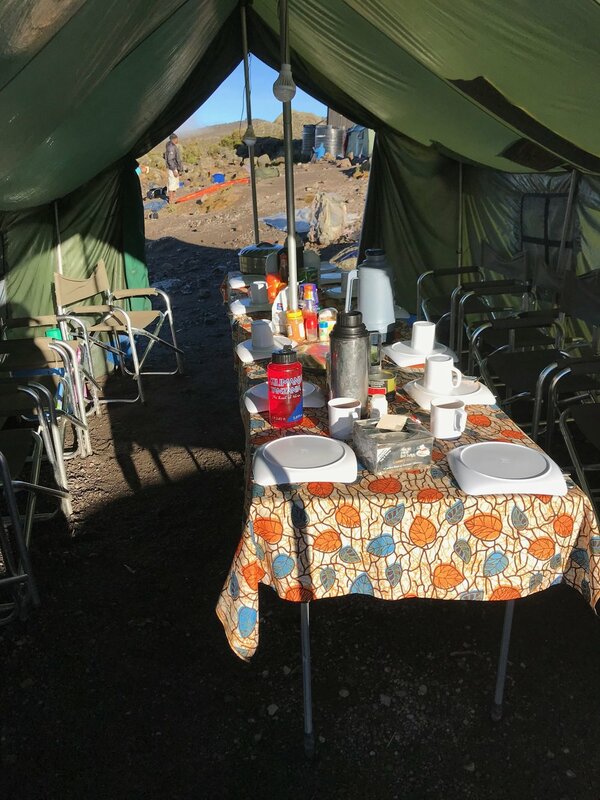 We ate our first dinner in the dining tent—vegetable soup, spaghetti bolognese and avocado salad. We also had our first round of “vitals” taken to ensure that everyone remained healthy throughout the trip. Our first night in the tent was restless, but we fell right to sleep in the nights that followed. Porters wake us up at 6:30 with hot coffee and warm water for washing before breakfast. As we hit the trail, there was a light mist that continued as we progressed through the remainder of the rainforest. 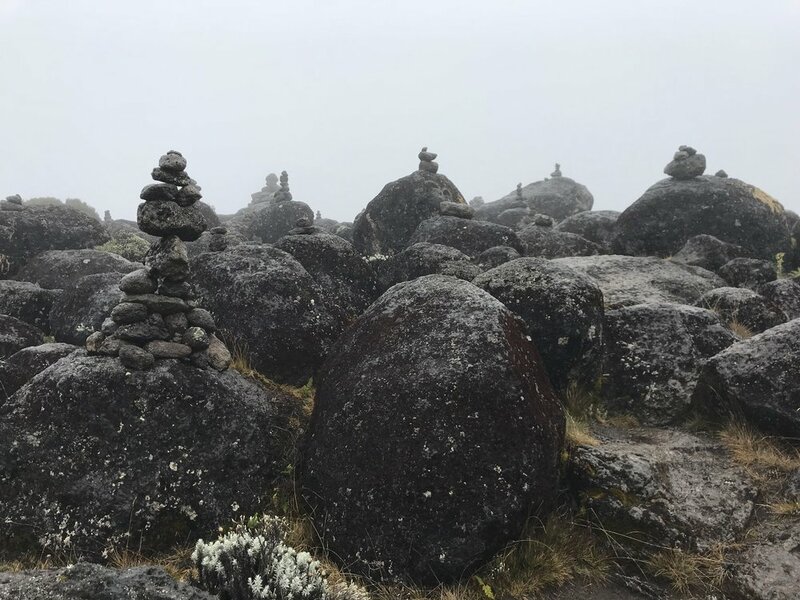 We passed 10,000 feet and into the Moorland climate zone—it felt like we were walking in a cloud! The rain picked up throughout the day and put our rain gear to the test. The primarily uphill climb was split in half but a lunch stop with carrot soup, pasta salad, fried fish (!) and veggies. Our “servers” hid a surprise candy bar under our plates as a special treat. The last bit of the hike was downhill and we were happy to make it to camp and out of the rain. At camp, we drank tea and played cards before dinner and turned in early after a long day! A much better night of sleep with a 6:15 wake up call. The porter and guide team did introductions with singing and dancing before we hit the trail. It looked as though we might get some sun, but it quickly faded to fog as we began our hike. The route was fairly flat and allowed for a slightly quicker pace. 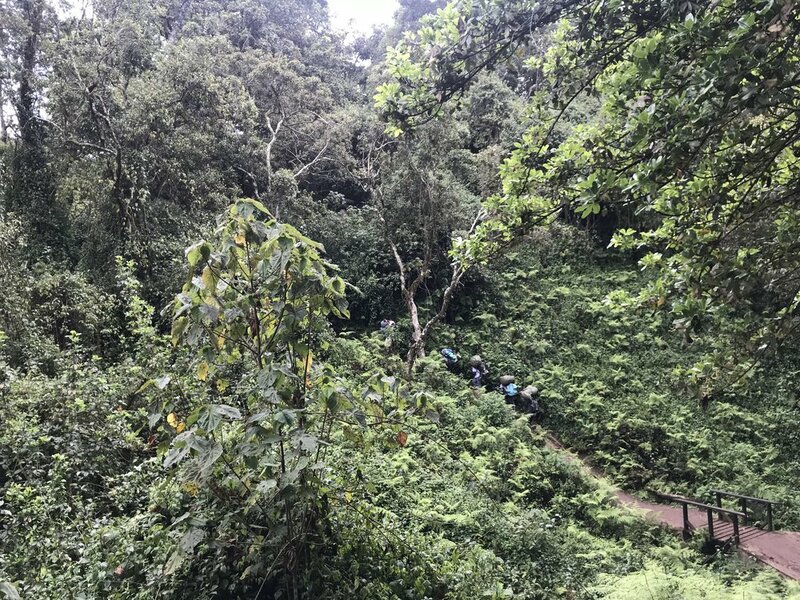 As we moved further from the rainforest, there was a noticeable decrease in plant life as the trail was surrounded by large rocks. Fog turned to mist and rain as we reached the Shira II Camp, persisting through the afternoon. We had a planned acclimation hike, but it was canceled because of the rain so we spent our time in the dining tent having fun with our other team members! We woke up earlier than past days (5:45) to get an early start on this long hike day. The day was split into two parts: an uphill to “Lava Tower” at 15,000 feet for lunch, followed by a downhill to our camp at 13,000 feet. On the uphill, we were greeted by continued rain. The highlight was a brief moment of sun that brought a rainbow! Getting closer to the stop for lunch at Lava Tower, rain turned to snow and the air felt very thin. Matt’s “waterproof” boots did not live up to their name, causing a bit of discomfort. Lunch was a very welcome break with carrot soup and chicken tenders. The rest of the day was downhill but at times felt like walking down a waterfall because the rain was so heavy. We saw many new plants, including trees that seem to belong in a Dr. Seuss book. Closer to camp, the sun made a few appearances and Matt even put on his sun hat for a few minutes. After dinner on Day 4, we received news that due to weather conditions, a summit might not be possible for our group. 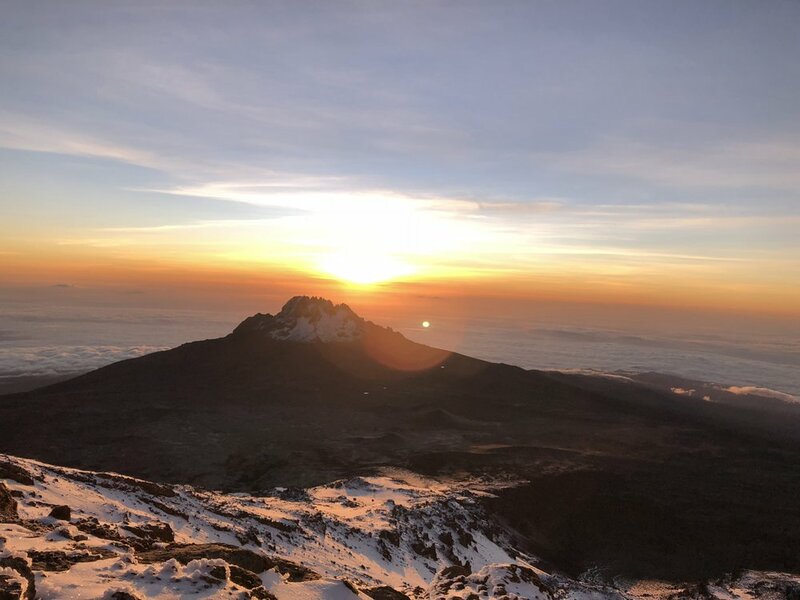 The groups attempting to summit the past two days were forced to turn back once they arrived at Barafu Camp (“Base Camp”) because of high speed wind and snow. Group morale was low after a difficult and wet hike day, but were all putting out good vibes for a change in weather. We continued to remind ourselves that even without a summit, we had already accomplished a lot—especially with our fundraising for the Leukemia & Lymphoma Society. Our wake up at 6:00 provided a much needed view of the summit and sunshine—providing hope after the tough news the night before. The start of the hike was a nice change of pace with an initial scramble up the 800 foot “Baranco Wall.” There was a light mist during our climb but we were set in our basic rain gear. The guides were extremely helpful as we avigated the trickier portions of the steep wall. Once we made it to the top, everyone got to try their best “jump photo!” Our hearts sank when we witnessed a porter drop one of his bags (a gas can) and it tumbled down the wall and over a cliff. Luckily he was able to find it and we cheered him on when he caught up with us on the trail. After the wall, the rain picked up and we put on our ponchos (Kelsey’s worst enemy by day 5). We had a large downhill, followed by a large steep uphill to camp as we crossed through a river valley. We were rewarded with pizza for lunch that day, but the group was still left questioning whether we would advance to Barafu / Base Camp the next day. We filled our time in the afternoon by teaching the porters the dance to “In My Feelings” by Drake—one of the challenges we were tasked with at our Cincinnati fundraiser! We woke up to a sunny morning! After breakfast, we started the day by singing and dancing with the porters and guides. Per our “challenge” we got all 44 of the crew plus our team of 10 to do the “In My Feelings” dance, making for a perfect start to the day! On the hike, hope in our ability to attempt the summit was restored as the sun overtook the clouds. We applied sunscreen and regretted having worn long underwear on the route. We started with a slow ascent leaving Karanga Camp, crossing a valley leading up to Base Camp and enjoying the first use of our sun gear. We made it to Base Camp as an excited group with clear views of the summit. After arriving, we had lunch and a short nap in our hot tents before our summit gear check. Once our clothing was approved, we had a big dinner followed by the summit briefing where we learned that we would set out for the summit at 11:00 PM that night—leaving just a few short hours for rest (yeah, right!) before we began. Summit night began at 11:00 PM on Saturday and continued into Sunday morning. 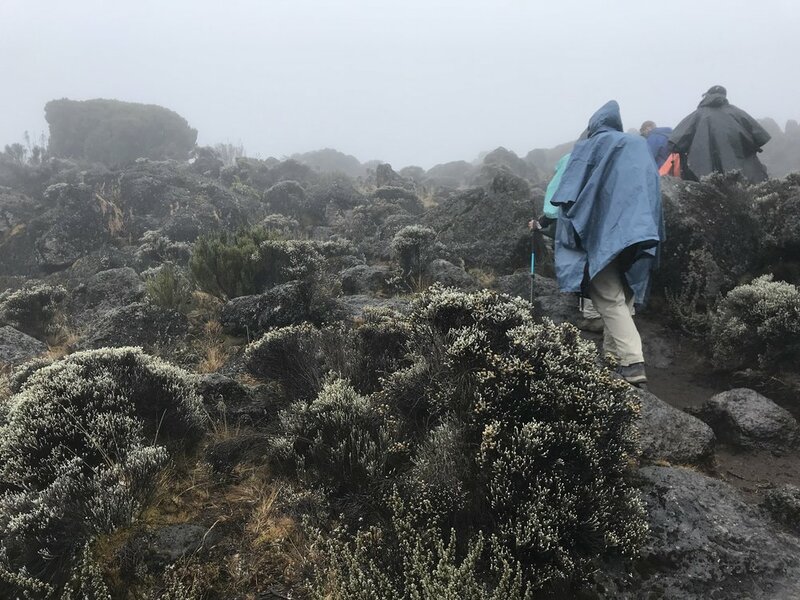 After a brief “breakfast,” we put on the last of our gear, turned on our headlamps and started the slow hike up over 4,000 feet to Uhuru Peak—the highest peak in Africa and the tallest freestanding mountain in the world. As we hiked, our lead guide, Wilfred played a mix of Bob Marley and Celine Dion hits. We put one foot in front of the other, doing our best to stay warm with hand warmers and hot tea that the guides miraculously produced along the way. Kelsey survived on Reese’s Cups (the only snack that didn’t freeze!) and My Heart Will Go On lyrics. As altitude increased, we both felt the effect of the thin air, swaying off in any direction where attention was focused. Matt developed a headache along the way but guides kept a close eye on everyone, offering to take packs along the way. They are truly amazing! When the sun started to come up below us, we couldn’t believe we had already been hiking close to 7 hours! After taking in the incredible views above the clouds, the remaining ascent went quickly. Arriving at the summit, we had to take a moment to sit down, catch our breath, and take in the accomplishment. We were then prompted to quickly take our pictures and start the descent after just 20 minutes—any longer and the altitude could have a negative impact. The return trip to Base Camp was sunny, melting the snow beneath our feet and creating a slippery slope for descent. It often felt like we were skiing down the mountain, complete with a few wipeouts! Because of Matt’s headache, he was quickly ushered down the mountain by our guide, Sunday, and made it back to camp by 11:30 AM. Kelsey was met by a porter with about an hour left in the return to Base Camp and he took her arm and steadily slid back with her! Once the team was back at camp, we had a quick rest, packed our bags, had lunch, and began another 4-hour hike down to our final camp. The terrain was downhill but rocky, and with our jelly legs it was one of the toughest challenges of all. Reaching the camp was a relief, and we all fell asleep the moment we hit our inflated pillows. Our refreshed group discussed sore muscles and sunburns over breakfast before starting our final hike to our ending gate. After the exhausting summit day, the gradual descent on fairly even ground was a very welcome change! Our team was in good spirits as the weather warmed up and the climate returned to Rainforest. We kept our eyes peeled for animals and saw two types of monkeys among the huge trees on the route. We moved quickly and celebrated when we reached the final gate, getting the mud cleaned off our boots before boarding the bus to our celebration lunch. At lunch, we were served from unending trays of food before a dance party broke out. While we danced, three different cakes were presented for the two LLS teams and our team member, Kimberly’s, birthday. We then received our official summit certificates and in turn handed out tip envelopes to all of the porters and guides, saying our goodbyes to each one. It was sad to part with the people who made our entire trip possible—we truly couldn’t have done it without them! After lunch, we rode back to our hotel and enjoyed our first shower in 8 days! That night, we went to dinner with our team before everyone parted ways the following day and we began our long trip back to Cincinnati. We spent our travels inspecting photos and sharing our favorite memories, constantly questioning if we had really done it. The ache of our legs each time we attempted to stand confirmed that it wasn’t just a dream. Thanks again for following along with us, and for your support of the Leukemia & Lymphoma Society!